On 7 November, President Vladimir Putin appointed General-Colonel Pavel Anatolyevich Popov to be a Deputy Minister of Defense. 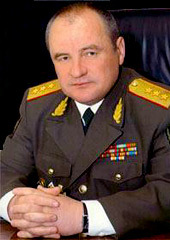 Popov had been an assistant to Defense Minister Sergey Shoygu. Popov’s the latest in a series of Ministry of Emergency Situations (MChS) generals to come to the Defense Ministry. They all served alongside Shoygu for many years. Popov’s page is up on Mil.ru. But his bio is better on the MChS site. The 56-year-old Popov was commissioned an army lieutenant in 1978. He served in the GSFG and the Far East MD before switching to Civil Defense in 1990. He headed a couple MChS regional centers as well as the Civil Defense Academy before becoming a deputy to Shoygu at MChS in 2008. Popov specialized in C2 and developed the crisis command and control center at MChS, according to Izvestiya. He’ll replace departed Dmitriy Chushkin, who had responsibility for C2 issues. As Shoygu’s assistant, Popov was already responsible for standing up the new National Command and Control Center for State Defense (NTsUOG). Overall, Shoygu now has two first deputies and eight deputies.